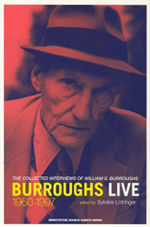 Burroughs Live gathers all the interviews, both published and unpublished, given by William Burroughs, as well as conversations with well-known writers, artists, and musicians such as Tenessee Williams, Timothy Leary, Patti Smith, Keith Richards, Allen Ginsberg, Brion Gysin, and Gregory Corso. The book provides a fascinating account of Burroughs’s life as a literary outlaw. Illuminating many aspects of his work and many facets of his mind, it brings out his scathing humor, powerful intelligence, and nightmarish vision.